The collaboration works of three outdoor-inspired female artists who sought to embody the three totems of Something Independent’s Trade School 2018; Women, Water, and the West. I wasn’t expecting a message from Chuck Sullivan of Colorado’s Something independent asking me if I’d be interested in leading the art direction for the summer outdoor retailer show. It honestly felt like it was just yesterday that I was sitting at the first ever Trade School at the Winter Outdoor Retailer show listening & learning from some of my own art inspirations, Sarah Uhl & John Fellows. What an honor it was to be considered in such company, I didn’t know what was going to come from this experience, but I jumped in for the ride. Water, Women, and the West drove the visual direction of the works created by artists Andrea Slusarski, Noelle Phares, and Kat Carney. The original works ‘FACADES’ and ‘TREEHOUSES’ created the visual representation behind four days of inspired discussion and informal collisions with leading athletes, advocates, entrepreneurs and artists of the outdoor industry. During their residence at Aloft Hotel Denver during Outdoor Retailer 2018, the three artists gave a panel discussion to the audience about the creation of these works, and about the nature of a female artist’s career in 2018. 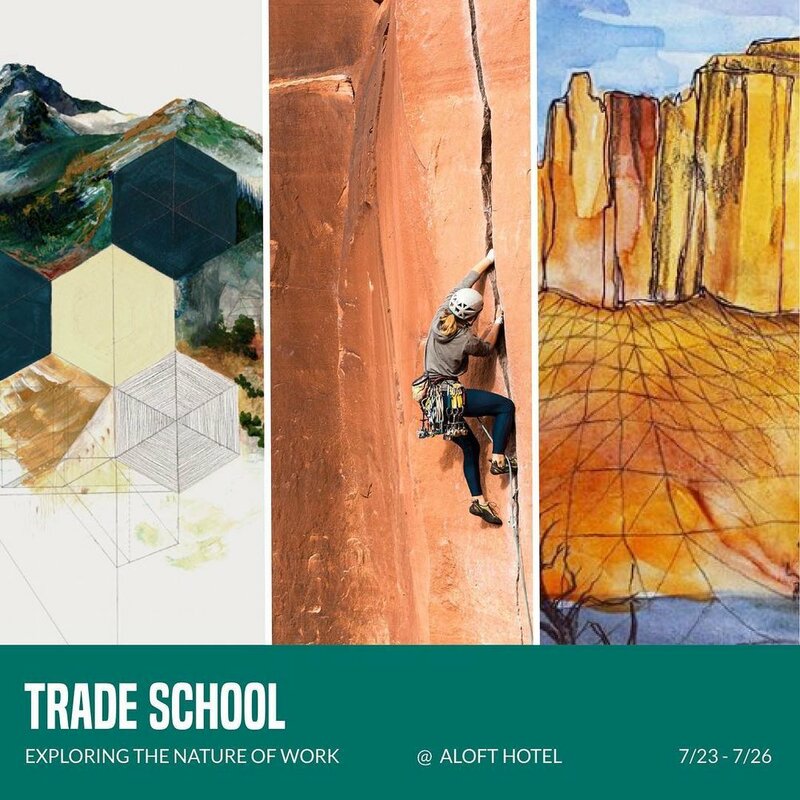 It was such an amazing experience being a part of TRADE SCHOOL // so thankful for all the PEOPLE, LANDSCAPES and RELATIONSHIPS that inspire & lighten our curiosity. Huge thanks to Chuck Sullivan & his team at Something Independent for believing in REAL work. Also big thanks to my friends Kat & Noelle, for following me down the crazy creative journey.